As many of you know, we’ve been in the throes of an intense election. Last month, Autism Speaks’ Becca Barnes challenged Team Up Captain Luau to see who could run the most Charity Miles for Autism Speaks in the month of October. I added a little twist by allowing anyone to tweet-add their miles to #TeamBecca’s or #TeamLuau’s totals. 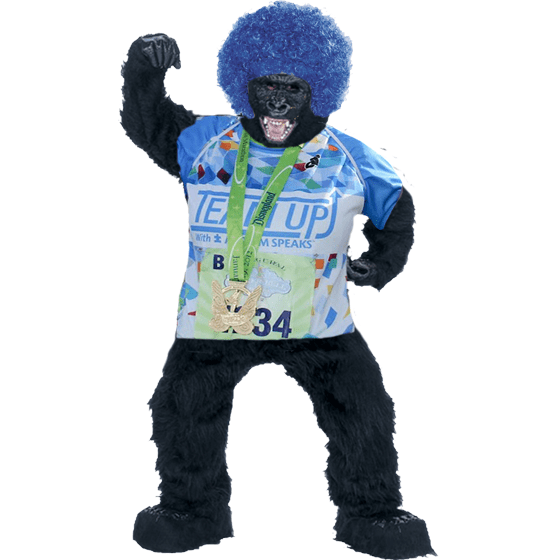 And Becca added a little flare: The loser has to run the difference wearing a gorilla suit, Autism Speaks jersey and blue afro wig. After the first week of campaigning, #TeamBecca had 221 miles– a comfortable 29 mile lead over #TeamLuau. But, with one week left to go in the challenge, #TeamLuau came roaring back, bringing him up to 446 miles– a 4 mile lead over #TeamBecca. It was neck & neck into the homestretch… But The People have spoken! #TeamLuau finished with 604 miles, beating #TeamBecca by 40 miles! Ouch! 40 miles is a long way to run in a gorilla suit! I might have to go down to Florida to help her out. Anyone else with me? After all #ChangingTheWorld is a team sport! Speaking of elections, we’d like to remind you to get out and vote today. Even better, vote with your feet by walking some Charity Miles to your voting center. Tweet us that you voted and you could win the T-Shirt below. #WalkTheVote! I want to thank #teamLuau for your incredibly hard work and extend my best to #teamBecca for a hard fought, positive campaign. And a special thanks to Gene at Charity Miles for making this all happen! In the end, everybody wins!!! I hope that you go out today and vote – whether you are right or left, red or blue, what matters most is making your voice heard! Oh Snap!!! This just happened! I think I’m gonna need some running, walking, biking help! 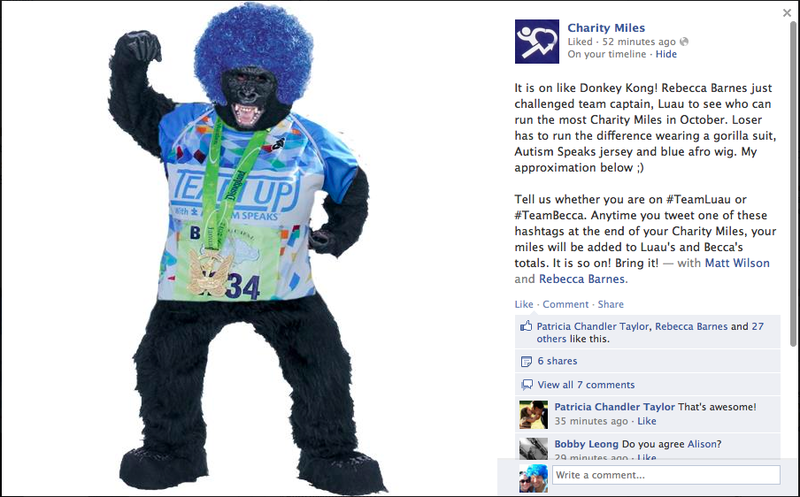 Download Charity Miles and whenever you walk, run or bike, hashtag #teamluau so we can see Rebecca run in a gorilla suit! Update: I somehow missed this email that went out to ALL Charity Miles users…this friendly challenge has just gone national. Loser Wears a Gorilla Costume! Dear Team Charity Miles,Remember our friend, Luau? Last month he rocked the Boston 13.1 Half Marathon by personally shuttling every Autism Speaks team member to the finish line. 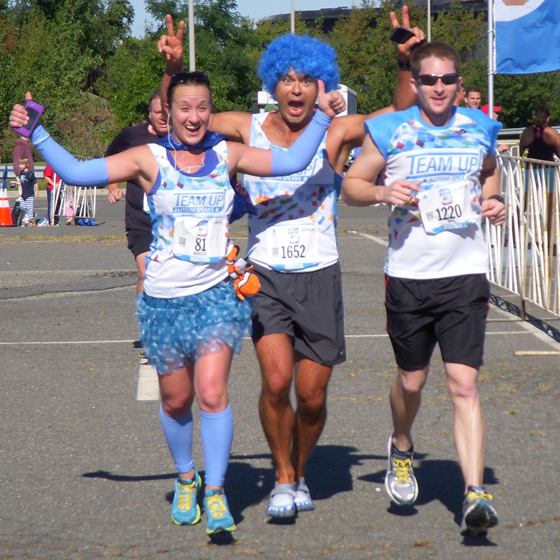 That’s him in the picture above, running with another Autism Speaks All Star, Rebecca Barnes. 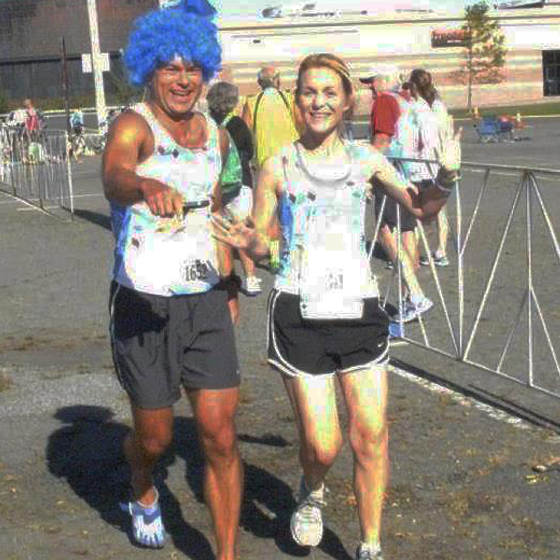 Well, now Rebecca wants to repay Luau for his chivlary… by personally challenging him to see who can run the most Charity Miles for Autism Speaks in the month of October! See the full Twitter-war on Luau’s blog here. Rebecca drew first blood last night with a 2.6 mile run. But Luau came right back with a 6.8 mile run of his own. Ouch! It is so on! If I can be so bold, I’m adding a new dimension to this challenge. Tell us whether you are on #TeamLuau or #TeamBecca. Anytime you tweet one of those hashtags at the end of the Charity Miles (for any charity), your miles will be counted to Luau’s or Rebecca’s totals. Bring it!